The projector is such a vital piece of hardware that it’s difficult to imagine a classroom without one. 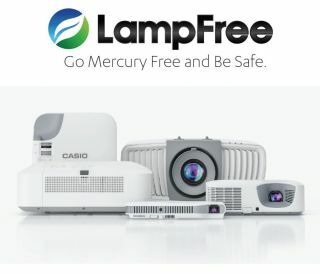 And in recent years, projector technology has significantly improved with lamp-free models that extend product life and require minimal, if any, maintenance. At the same time, flat panel TVs have become more available as a choice for school projection needs. There may be some situations where a flat panel makes sense, such as working with small groups of students in learning stations. However, flat panel displays have a fixed size that can be a serious issue in larger classrooms when viewing text and numbers on spreadsheets. In larger classrooms, it would be difficult for students in the back of the class to view the screen in sufficient detail to accomplish the lesson goals. After the aggravation and costs of replacing lamps and filters on older projectors, many schools and districts may consider flat panels, but the new solid state (Laser and LED) projectors are still more cost-effective when compared to flat panels. Both the newer projectors and flat panels have minimal maintenance costs, but flat panels have a higher TCO due to the initial purchase price. When thinking about the kinds of interactive, collaborative environment schools want to establish with their projection requirements, the flat panel has limitations. It is two-dimensional whereas one or more projectors can be used to create a 3-D environment, which can illustrate concepts such as the solar system or the inner workings of the heart in a way that immerses students into the lesson not possible before. Another benefit to using laser or LED projectors is that it is “green” technology and decreases a school or district’s carbon footprint. The projectors use 30% less electricity than older projectors, eliminate mercury, and reduce Coemissions with lower power needs. With an estimated 20,000 hours of operation, projectors may have a longer life span than flat panels and eliminate additional lamp and filter costs. While schools might opt for an occasional flat panel, most schools will find laser or LED projectors a better option when considering flexibility of use and TCO. Although both new projectors and flat panels have minimal ongoing maintenance costs—the projectors’ initial cost is far less than that of flat panels making them a better financial choice, with the added benefit of promoting sustainable, green technology. To learn more about projection options, there are links below to additional resources that can be helpful as leaders make this technology decision for their own school and districts. WEBINAR—Join our panel as two technology directors in Alabama and Illinois share how their schools are using projection technology to create more engaging learning environments for their students. Click here to read more. CASE STUDY – In Poway United School District outside San Diego (CA), district leaders saved so much money by replacing their aging projectors with new lampfree projectors that they were able to divert funds to their highly innovative initiative to bring more personalized instruction to their students. Click here to read more. SUSTAINABLE TECHNOLOGY – Looking for a quick brief to understand how laser and LED projectors are changing the projector marketplace? Check it out here.